Take two minutes to enjoy this movie made by the Congress for New Urbanism. It explains a lot of the problems we all see today and should get you thinking about other ways we can help to change the earth. New Urbanism will be a huge step forward in reducing the demand and dependence on oil, space, cars, etc. It focuses on improving the areas we already have to make them better/ safer/ more sustainable living environments. Ever since the 1950’s, America has been suburbanizing. As GI’s returned from service after WWII, they were given subsidized loans to buy new houses. Developers took advantage and bought cheap land outside main living areas and developed them into single family homes. 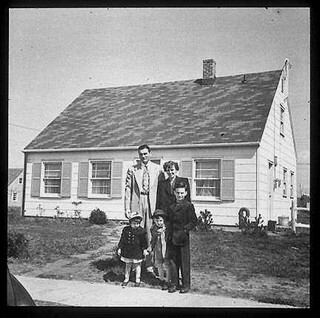 It was “The American Dream” to have your family own a single family house with a front and back yard with a driveway and garage for your family car. Take a look at any advertisement for a car from those times and you will see they were sold as family items. It was all about family- moving to the suburbs kept your kids safe from all the crime, pollution, traffic, etc that American cities had been known for. Afterall, cities were the first places immigrants would come to (New York because of Ellis Island for example). Immigrants most often would have very little of anything if not nothing at all, fueling the benefits of theft and reputation. Cities grew to be known as unsafe because of the rampant crime and violence associated with it. The saving grace from this was the car, which allowed for suburbanization. You could now live outside the city where it was safer, and commute to your work place in your car. Llewellyn Park, NJ, what many scholars call the first suburb, was designed by “a New York business man who practiced the religious doctrine of the Perfectionists, who believed that spiritual or moral perfection could be attained, and planned the development for fellow believers.” Naturally, more developments sprung up along roads and highways (as well as train and trolley lines) into the city, as people needed to commute to their place of work. The suburbs were desirable, expensive, and dominantly white middle to upper class families. The problem now was that the stay at home parent (in the 50’s, the American Dream said the mother was to do this) needed to still run errands, so a second car was needed so the mother didn’t have to carry the groceries over a long distance over busy roadways; more space was needed to house the car at home, more space was needed to park it at the shops, and more roads were needed to deal with the capacity of all the cars driving different places. It was great for the economy- Americans needed more and it put millions if not billions to work on roads, new houses, real estate agents, bankers, insurance agents, car manufacturers, engineers, etc., etc. Only now are more people starting to realize this is not a sustainable economy. As a result of suburbia, architecture and social life as suffered. Many places are biased in terms of age. Children cannot go to downtown areas, visit their friends, or even play at the park without a parent driving them as it is unsafe to walk on the roads, or too far in distance, and there is no public transport because it is not economically sensible or sustainable. Architecture suffered because businesses that survived during that era moved their buildings back to allow for excessive parking in front. Architecture didn’t matter from the street if the building is separated by 100’s of feet of (often empty) parking pavement. Think Big Box Retail. As new generations have replaced the old, the 1950’s dream has started to fade. It was successfully passed down to at least one generation (children of the 50’s and 60’s), but as the newest generation of young adults arises, hopefully the collective image of American cities can change. Tonight Peñalosa will speak in San Francisco about creating this vision and putting it into practice.It was mark the launch of the Great Streets Project. “Valet bicycle parking provided,” according to the website, http://sfgreatstreets.wordpress.com/. Campaigns like this are slowly changing the way we live by reducing our dependence on oil (both domestic and foreign), improving the environment (air quality, oil runoff in sewers, built and social environments in public spaces), and reducing overall costs while further promoting the local economy. Today is going to be slightly different than past posts as I will talk about the transition from the office to the outside built environment. I was glancing about Yahoo! when I first came into work and one article I read got me thinking. It talked about several ways you can make your office space more pleasant, and I found that many of the tips they had given can be transformed to work as tips for making the built environment more pleasant. The first tip mentioned is to reuse drinking cups because some materials take a long time to break down in landfills. Lots of materials buildings are made out of can be reworked to be recycled. One example comes from one of my earlier post about Cleveland where locals took bricks from a school that was to be demolished and placed the bricks as walkway inside a community garden near the heart of the city. Not only can bricks be reused, but many of the metallic materials can be smoldered down into new products as well. The second tip they gave was to make your lunch and bring it to work. It is a simple way to save money, but if you were to make your own food in your backyard or community garden, think of the money you can save while at the same time avoiding chemically altered fruits and vegetables. It may be a hassle to do this for many people so this idea may be out of the question for many people, but at the same time imagine if it became the trendy thing to do. Tip number three is to breathe fresh by livening your desk with a plant or two. Countless studies show that greenery increases happiness and that as humans, we love being around nature. When we step out to our streets, it should not be a jungle of cars and the infrastructure to support them, but rather a pleasant built landscape that is comfortable and exciting to walk through. The final tip is to dress the part- come into work with clothes you bought second hand and advertise your ways. The advertising of this part is crucial, because too many people do not feel this part is feasible/ socially acceptable/ economically beneficial, etc. By being obvious about your ways shows your confidence in your beliefs, and may persuade others to jump on board with you, even if it is slightly. There of course are implications with these tips, mainly the economic impact it would have if a large portion of people started to employ these ways. At the same time, we should not underestimate the ability of human personality to adapt to the conditions. It’s hard to have to pull together a consensus on a whole community of people, if not impossible. Determining which public inputs and ideas are better may lead to compromising some other goals determined by the community. A community likely cannot be walkable and transit oriented if the goal of the community is for everyone to own a car. The trade offs between values like these are ones where community visioners must extract the most important details from. Talking amongst the community members may eventually take shape into an idea of what the community wants to look like, but there are other tools that are much more effective and time efficient. In today’s world of globalization, there are many communities that feature more than one primary language. Talking might not just be an option to gather a fair public input. This brings me to the most important tool in visioning: visual representation. Visual representation can be anything from charts to blue prints to computer designed buildings and areas. Upon seeing these representations, people can choose whether or not they agree the mechanisms brought forth by the visioner has a place in their community. Visual representation of ideas is the best way to communicate because there is a clearer understanding of what is being presented with little room for self interpretation and there is no foreign language that needs interpreting. There are many more case-specific reasons visual representations are great tools for community visioning, but this should tickle the mind of anyone seeking a community visioning process. Lexington, KY has been a city of earlier discussion on this site, so I thought it would be a good idea to revisit the city. One of the main sections of the city, the area surrounding Triangle Park, had been severely under utilized. Like a typical American city, disinvestment in the downtown areas in favor of suburban areas left this area of Lexington in need of a make over. But residents did not want to scrap the old architecture that had stood for many years and was part of the culture of the city. Instead, buildings in Victoria Square were allowed to stay even amongst new building codes thanks to the willingness of a few local preservation and revitalization advocates. What had been a haven for rats, pigeons, graffiti, and the homeless, has now been transformed into an enjoyable square with restaurants and studio apartments overlooking Triangle Park. The revitalization of this area of Lexington is a great example of how planning a community with the involvement of local residents can be a great tool for a successful rehabilitation project. Take a moment to look at the picture (from http://www.city-data.com) above. Notice how nearly all the buildings are 3 stories, each building has a small relatively small building street fronts, and the buildings are real close together (in fact they are touching). This is typical of older style urban design and is very desirable for people. The streetscape of small banners, lights, and trees also contributes to this being a desirable area, and is an sample for good urban design. Today was a bad day for open space advocates in New Jersey as the NJ Supreme Court upheld a ruling that determined it is unlawful to make housing developers set aside funds for open space. Developers argued that it was a “victory for residents of New Jersey and future generations who want to live in the state” because it will lower the cost of housing development, which could range from $1,500 to $3,500 per housing unit, according to the Press of Atlantic City. Now while this ruling may have some people pleased, it puts the power of creating open space in the hands of the developers; let’s not mistake the goal of developers before a go further. Developers are a business, and their goal is to make money by building houses. The ideal situation for developers would be to develop the entire area of land they purchased and sell it after building on it. However, some factors may be able to make the selling price higher on the units built- for an example, a neighborhood pool or tennis court or playground. But these factors do not play such a large role in the cost of a brand new house. Housing is all about location, location, location. If developers do make adequate open space in their new developments, then I applaud them for doing so. However, since they are building for money, I do not think these developers will allow for adequate open space needed for people of all ages and abilities to play and socialize in. The best way to make sure everyone has adequate access to open space to educate others about the importance of it and to encourage others (and yourself) to avoid buying houses without adequate social environments. Maybe developers will then pay adequate attention to open space. Today’s post takes on a view of the economics behind community visioning. Santa Barbara, California provides an interesting case study about the history, present, and future of the city. Residents say Santa Barbara has a small town feel to it, but to accommodate for the growth of the city, planners are suggesting increasing the building density. Residents are torn between what should happen next. On one hand, housing is very expensive. Noozhawk.com reports that, “an average luxury unit would sell for $1.4 million, a standard unit for $800,000 to $900,000, the work force units for $400,000 to $500,000 and a moderate unit for $300,000.” To thicken the plot, many people want the small town character to remain with the current housing structures, but others are willing to sacrifice and downsize into smaller apartments and homes to help them afford their units. These are problems planners and visioners have to deal with, but it is not entirely up them. It is the job of the planner, in this instance, to be more a mediator between the two sides to build a general consensus of the public. Santa Barbara will decide whether to become a model for cities by placing small, energy efficient, transit oriented development, or whether to keep the “small town” tradition that has become unsustainable financially.